The best one (and a lot of other good stuff as well) is from Kiko Denzer. Grand Rapids Michigan has a web publication called The Rapidian. 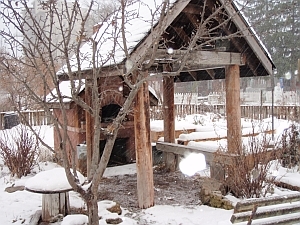 They published this interesting article about community bread ovens. Our visit to Kitchener: After they gave a Rotary Club presentation on bake ovens in Cambridge, Ontario, Anna, Mayssan and Jutta went up to Kitchener to see the Working Centre, in particular the cafe and the bake oven. One of the centre's long-time supporters and collaborators, Ken Westhues, had sent us an essay he wrote about producerism, published in the Working Centre newsletter ten years ago. The paper is full of interest, and the Working Centre is as active as a beehive. 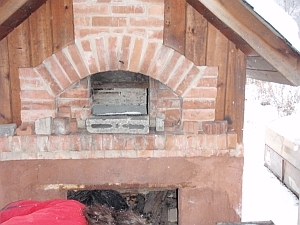 The bake oven is beautifully made, only too small, and somewhat out of the way.